Data Protection or Information Security has become a serious, board level concern that has C-level management and IT professionals investing an inordinate amount of time and resources to mitigate risks. News stories about cyberattacks and data breaches have become commonplace and experts are unanimous that it is no longer a question of If a cyberattack will succeed, but When?. These breaches are extremely costly and new regulations such as the General Data Protection Regulation amplify those costs. Historically the emphasis has been on perimeter defenses; bigger and better firewalls, antivirus and other malware detection technology. Data Loss Prevention (DLP) tools help address exfiltration and the omnipresent internal threats. However, all this emphasis on walls and detection has the left the back end relatively unprotected. The back end being defined as all of the end-user controlled (EUC) files that are unstructured and may contain sensitive information such as PII or PCI. Like it or not, spreadsheets are ubiquitous and the reality is that some of this sensitive information is stored in these files. Industry experts estimate that the average employee has 3,000 EUC files. 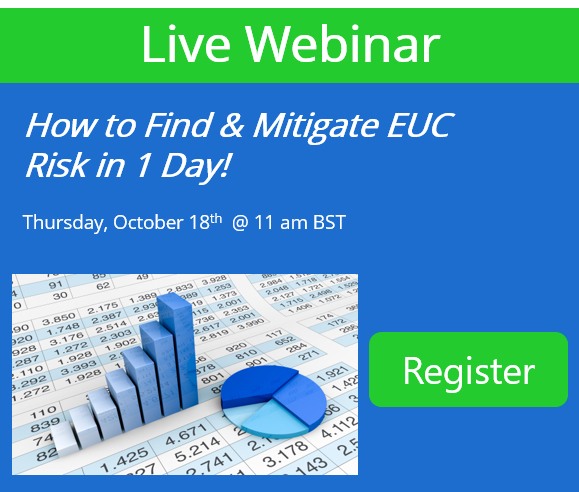 Given the punishingly high cost of a breach and the extreme size of the file estate, how can you reduce the cyber risk associated with EUCs and protect the back end? CIMCON provides software tools that should be part of your overall all cybersecurity architecture. Well known for its end-user computing GRC solutions, CIMCON technology is providing additional value in helping companies reduce cyber risks. The business improvement opportunities in big data and the high adoption of self-service analytic tools like Tableau and Qlikview further expand the cyber risk in EUCs. Given the sheer amount of data that exists, all company data cannot be protected equally. Consequently, it is important to identify the files that have inordinate risk to your business and focus efforts there. Despite the growth in analytics, spreadsheets are still the most widely used tools for analysis and reporting and often play a central role in financial processes. These spreadsheets and other end-user computing applications (EUCs) are used to manipulate sensitive data. These files are highly vulnerable to theft or fraud since they are rarely monitored or controlled. Accordingly, EUCs must be an important consideration when developing a cybersecurity strategy. Intruders may find a way into company networks but companies with a comprehensive cybersecurity strategy that cover EUCs have more of an advantage. Being able to know which files contain sensitive and business critical data and then being able to put proper controls around them can help protect that data. Standard user access mechanisms alone are no longer sufficient. Step #1 is knowing how many files you have, where they are and if there is sensitive information contained therein. CIMCON's EUC Insight Discovery scanning technology can rapidly search network drives and create an inventory of all of your unstructured, end-user controlled files including Excel spreadsheets, Word documents, PDFs, Tableau, Qlikview files and SharePoint repositories, just to name a few. Identify abandoned files that haven't been modified in years. Deleting these unused files is the best way to prevent them from being stolen and for large companies it can save petabytes of storage. Automatically scan these files for key information and highlight the files that have sensitive information like PCI or Social Security numbers. Display reports and/or output data to other reporting tools so you can determine where the biggest risks lie. EUC files that need to contain sensitive information should be secured so that when a network breach takes place, or there is an exfiltration attempt from within the company, the EUC files or portions thereof cannot be accessed. Location-based security that prevents access to a file by any user if it is moved from its normal file share location. Easy locking of ranges, formulas, pivot tables, sheets, and macros at an individual user or group level of granularity, protecting parts of a file so that only approved users can read and/or write. Provide tracking of the adding/modifying/removal of file level passwords. If a user edits a file so that it is no longer in compliance with company password policy, that behavior is tracked and email alerts can be sent to appropriate managers. Help support the third line of defense by giving Internal Audit the technology to determine that the processes for mitigating these cyber risks are in fact being used. CIMCON's EUC Insight Discovery tool can scan your network and create an inventory of all of your files including Excel spreadsheets, Access databases, Microsoft Word documents, PDFs, reporting files (Crystal, Business Objects, Actuate, etc. ), text files, and PowerPoint presentations. Identifies files containing sensitive data and most vulnerable to attack, using keywords or types of data. Creates risk flow, which follows data from one file to another and indicates linkages to visualize which files are connected. Once you have identified your most vulnerable spreadsheets, XLAudit closely analyzes them to help you remediate and reduce vulnerability. Spreadsheet diagnostics and documentation include: formula errors, inconsistencies, cells containing external links or queries, dependency mapping and side by side version comparison. Files with sensitive information should be secured so when a network breach takes place, any files found cannot be accessed. Enhanced normal file share permissions so managers can protect files and assign file privileges. Easy locking of ranges, formulas, pivot tables, sheets, and macros at an individual user or group level of granularity, protecting parts of a file so that only specific users can edit their section. Ability to create workflow around file usage so that all file changes must be approved before the file can be used. Files that are allowed to contain sensitive information should be monitored by EUC Insight Change Management as it maintains an audit trail of all changes. Tracks copies of sensitive files to either prevent copies from being used, or tracks copy behavior so that all files with sensitive information continue to be inventoried and monitored. Provides audit trail of the adding/modifying/removal of file level passwords. If a user edits a file so that it is no longer in compliance with company password policy, that behavior is tracked and email alerts can be sent to appropriate managers.